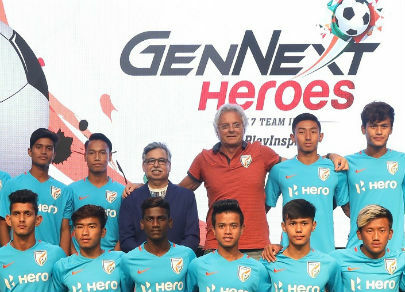 “These three measures will certainly go a long way in instilling a lot of confidence in our young players and preparing them for the intensely competitive big leagues at the global level,” Munjal – the Chairman, MD & CEO of Hero MotoCorp, the world’s largest two-wheeler manufacturer and one of the biggest corporate supporters of football in India, said. “The players are ready and the resources are available. The only thing that is required is consistent commitment on the part of administrators, state associations, clubs and coaches to give their best for the game,” Munjal said. Hero MotoCorp is the title sponsor of all the major domestic football leagues in the country, including the Hero Indian Super League, Hero I-Leagues, Hero Women’s League, Hero Super Cup and the Hero Intercontinental Cup. Hero MotoCorp was also the National Supporter of the FIFA U-17 World Cup held in India last year. Hero MotoCorp is the Team Sponsor of the Indian national men’s and women’s football teams across age groups. “On our part as long-term supporters, we are committed to continuing to contribute towards the creation of a sporting culture in the country, and we are convinced that football has huge potential to be a positive influencer for the youth. We are determined to play the role of a catalyst – a change agent – in bringing about a complete transformation in the ‘culture’ of football in India,” Munjal said. “If we collectively put our hearts to it, it is a matter of just a few years before football will be the chosen sport for millions of Indians. Simultaneously, the immense talent that lies latent within the country will begin to express itself on the world stage,” he added.